This bundle includes the BeatBuddy, the Singular Sound Footswitch, and the MIDI breakout cable for the ultimate BeatBuddy experience. 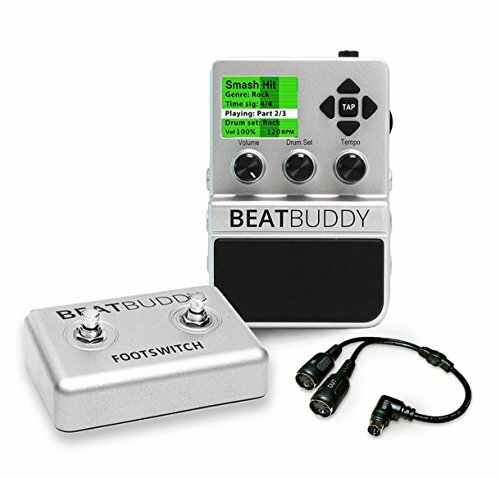 BeatBuddy is the first drum machine in a guitar pedal format that enables full hands-free, creative control of the beat. Musicians can effortlessly insert fills, transition from verse to chorus, add accent hits, throw in drum breaks, and more, to create an unprecedented live drummer effect - all in award-winning, ultra-realistic 24-bit sound. The non-quantized beats, recordings of real drummers, makes BeatBuddy the first drum machine to not sound like a machine. BeatBuddy is packed with features for musicians from all walks of life. A visual display of the beat makes it easy to improve rhythm or play with unfamiliar time signatures. MIDI Sync controls your loopers to make sure they're in time with the beat. Record directly from the BeatBuddy for professional-level drums on your upcoming album. Create gig lists and scroll through your songs, hands-free, during your next performance. It's the power of a drum machine with the simplicity of a pedal.